Soak pickles in cold water a couple of hours. Put a head or	two of dill and several onion slices in jars. 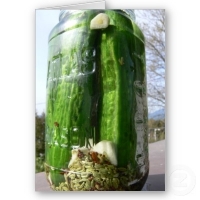 Split each pickle or	slice and fill jars. Put alum the size of a pea in each quart jar, also 1/2 teaspoon salt. 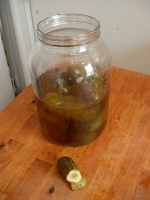 Bring syrup (vinegar, water, sugar) to a boil and pour over pickles hot. Seal. Put jars into canner. Cover with water. Bring water to a boil. Turn off heat. Let cool in water. Pickles will shrink, but will fill out in a couple of weeks. Will be good to eat in 2 weeks. Recipe categories: Condiments, etc., Water baths, Heirloom/historical.